Recent Budget announcements on both sides of the Tasman clearly indicate the Australian Government has had a borrow and hope strategy, while our Finance Ministers have taken a more prudent approach. The big question is whether Grant Robertson, the new Labour Finance Minister, will maintain this prudent approach when he delivers his first budget on Thursday. The first point to note in the accompanying table is the Australian Government has had 10 consecutive budget deficits and is forecasting a A$14.5 billion ($15.66b) deficit for the June 2019 year. By contrast, New Zealand has had four consecutive Budget surpluses. This trend is expected to continue unless the Labour Government adopts Australia's borrow and hope approach. 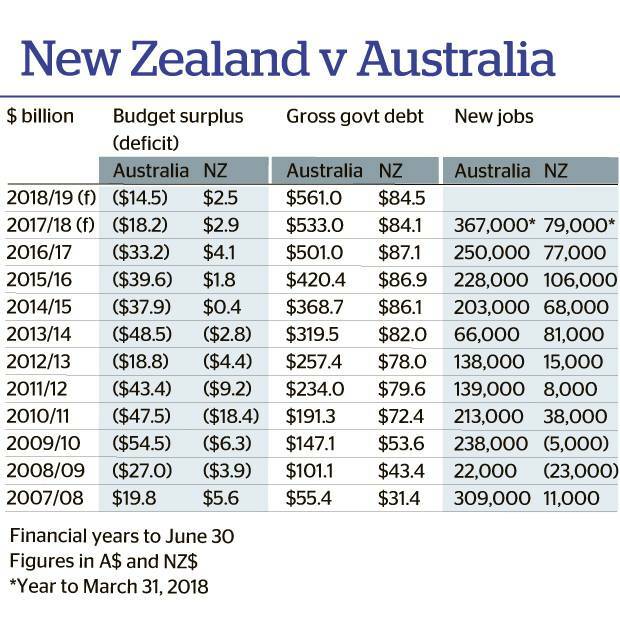 The Australian Government has had total budget deficits of A$368.6b over the past decade, while the NZ Government had deficits of $35.8b over the same period. The NZ deficit figure would have been closer to $20b if it wasn't for the huge costs associated with the Christchurch earthquakes. During this 10-year period, gross Australian Government debt has blown out from just A$55.4b to A$533b, or from 4.7 per cent of GDP to 29.6 per cent. Meanwhile, New Zealand's gross Government debt has increased from $31.4b to $84.1b, or from 16.6 per cent to 29.7 per cent of GDP. Although Government debt has risen in this part of the world, it is still relatively low compared with other countries. Japan has a gross Government debt to GDP ratio of 240 per cent and Greece 180 per cent. The Australian budget, delivered by Liberal Treasurer Scott Morrison on Tuesday, was set against a backdrop of a general election in the first half of next year. As the Liberal/National coalition has consistently trailed the opposition parties in the opinion polls, this week's Budget had an obvious eye on the election. Morrison blamed the Global Financial Crisis for the relatively poor performance of the Australian economy, which grew by only 12.8 per cent over the past five years while the New Zealand economy expanded by 17.8 per cent over the same period. Morrison told Parliament on Tuesday: "The Australian economy is now pulling out of one of the toughest periods we have faced in generations. The Global Financial Crisis was significant. But coming off our once in a hundred years mining boom had an even bigger impact, ripping $80b out of our economy." He went on to say: "We are no longer borrowing money to pay for everyday expenditure like welfare payments. We have retained Australia's international AAA credit rating from all three agencies, one of only 10 countries in the world to do so". The other AAA-rated countries are Canada, Denmark, Germany, Luxembourg, the Netherlands, Norway, Singapore, Sweden and Switzerland. The United States has a Standard & Poor's AA+ rating, while New Zealand has an AA rating. The Australian Budget statement was reasonably upbeat on the domestic economy. It stated: "Momentum in the Australian economy strengthened in the second half of 2017. This momentum is forecast to continue [and] GDP is forecast to grow by a solid 2.75 per cent in 2017-18 and to accelerate further to 3 per cent growth in 2018-19 and 2019-20". An area of concern for New Zealand is the Australian Government's emphasis on job creation, which was covered under the Budget speech headline "the Turnbull Government is backing business to create more jobs". This could have an impact on our net migration figures, as New Zealanders leave in large numbers when there are job vacancies in Australia and return home when employment opportunities are more attractive on this side of the Tasman. This trend is clearly illustrated in the two right hand columns in the accompanying table. Our net migration loss to Australia peaked in 2011/12 and 2012/13 — at minus 39,800 and minus 31,246 respectively — as job creation fell in New Zealand and remained relatively robust in Australia. The trend reversed dramatically in the following two years and in 2014/15 we had a net migration loss of only 1200 to Australia as job creation was relatively more robust in New Zealand. However, there has been a positive uplift in job formation across the Tasman and the Turnbull Government is determined to maintain this momentum. If it can do so, New Zealand employers will have to raise wages to keep their workers from moving to Australia. The alternative is that there is a large increase in net migration to Australia, a development that could have a negative impact on our residential housing market. In light of this, New Zealand Budget is awaited with interest. • Making the economy more productive, more sustainable and more inclusive. • Developing a modern economy that is better equipped to take on the opportunities and meet the challenges of a rapidly changing world. • Wanting to raise public spending and indicating that schools and hospitals are a major priority. • Moving investment into education and training for the workforce as well as putting more resources into trade development. • Increasing investment in regional New Zealand and on a low-carbon economy. Robertson told his May 1 audience that he is committed to the Budget Responsibility Rules. He said: "That means Budget 2018 will deliver a surplus. You will see it there on Budget Day. It is what we promised, and what we will be delivering, as a responsible Government". Robertson said the new Government will fund its wide-ranging initiatives by slowing down the Crown's debt repayment programme. This will free up funds to invest in infrastructure, housing and correcting the social deficits. In addition, tax revenue has tracked higher than forecast in recent months because of the strong domestic economy. This gives Robertson more financing options. The Finance Minister has emphasised repeatedly that the Labour-led coalition was a transforming Government but it would manage the books responsibly. There is no doubt that the new Government is fortunate as it has come to power when the economy is booming, tax revenue is increasing and the Budget surplus is tracking higher. The Financial Statements of the Government of New Zealand for the nine months to March 31, 2018 showed that tax revenue was 1.9 per cent higher than expected and the Crown had a surplus of $3.3b for the nine-month period, compared with a forecast surplus of $2.4b. This positive trend should continue, as the Treasury is forecasting NZ GDP growth of 3.6 per cent for the June 2019 year, compared with Australia's 3.0 per cent forecast. Finance Minister Robertson has the world at his feet and Tuesday's Budget will give us a strong indication whether he can take advantage of this while still reporting a Budget surplus. However, we should also keep an eye on Australian developments because a continuing surge in job creation across the Tasman could lead to an outflow of workers from New Zealand with a potentially large impact on the domestic housing market. The good news is that the Australian economy isn't quite there as far as job creation is concerned, as it is still heavily reliant on part-time work formation, which won't attract New Zealanders across the Tasman. For example, 40 per cent of the 845,000 new jobs in Australia over the past three years have been part-time, while only 10 per cent of the 262,000 new jobs in New Zealand have been part-time. New Zealand is still in the driver's seat as far as Australasian economic growth is concerned, but Australia is catching up.